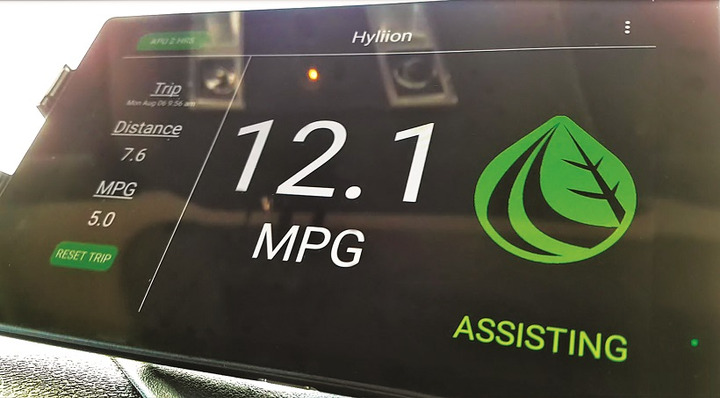 Hyliion’s hybrid-electric system makes the truck feel like you have only half a load in the box. Hybrid is no longer a four-letter word. It may still leave a sour taste in the mouths of those who invested heavily in the hybrid concept a decade or so ago, but Hyliion’s 6-by-4 Hybrid Electric (6x4HE) propulsion system will put money in fleets’ pockets without the help of tenuous government subsidies. Come to think of it, Hyliion might even sweeten the industry’s feelings on 6x2 axles. 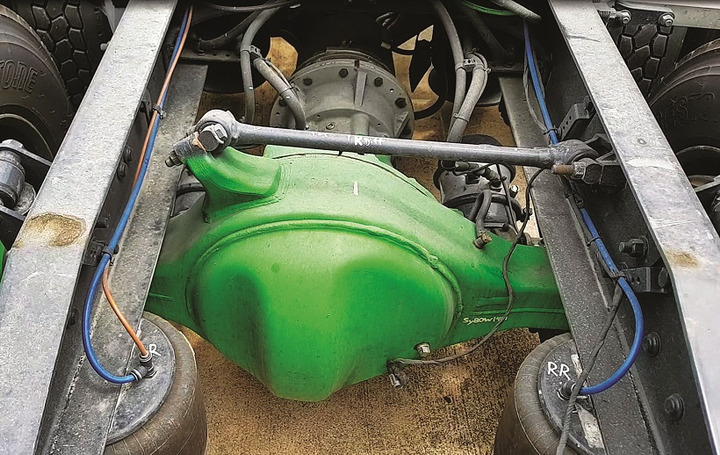 The system, developed by Hyliion, formerly based in Pittsburg, Pennsylvania, but now in splendid new digs in Austin, Texas, is “simply” an electric drive axle added to a typical 6x2 tractor. It’s not designed to assuage the traction concerns sometimes associated with 6x2s, but rather to supplement the existing diesel powertrain by kicking in a little extra thrust to ease the burden on the diesel. The beauty of the system is that the energy used to help drive the truck is essentially free, generated by the momentum of the truck while rolling downhill or while braking. the hybrid electric rear drive axle, which adds up to 120 hp and 1,500 lb-ft of torque. The hybrid electric drive axle has a motor mounted where the carrier would normally be. Gear ratios have to be adjusted for the high-rpm electric motor, but otherwise it’s just like any other drive axle. It’s all neatly packaged to hang off the frame rails just ahead of the drive wheels and between the frame rails directly behind the cab. All together, it adds 800 pounds to the vehicle by the time you consider the axle swap-out. This system also qualifies for the 400-pound auxiliary power unit weight exemption, which lowers the impact of the weight to 400 pound where the APU weight allowance is provided. 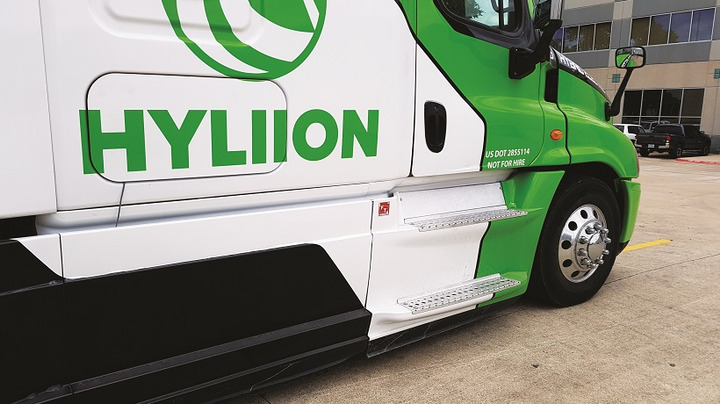 According to Thomas Healy, founder and CEO of Hyliion, the hybrid propulsion system can deliver up to 15% in fuel savings in the optimum operating environment, which is rolling hilly terrain. A feature that's currently in development is a GPS-based predictive cruise control system that reads the road ahead and plans for whatever charging or power assist cycle the terrain might present. It was on the test truck so I got a sneak preview. There was a moment when we were climbing a small hill that I noticed the system wasn't helping out with the climb and I wondered why. Jennifer Moreci, the product manager at Hyliion who was riding with me, said the system was conserving its charge for a larger hill that lay a mile or so away rather than use it on the smaller hill we were climbing. It’s smart that way. The battery also can be used to power an electric HVAC system with a capacity of at least 10 hours of air conditioning and normal hotel loads. Healy said the APU feature saves an additional 12% in fuel consumption compared to idling for climate control. All the hardware except the axle and the motor fits onto a single pallet for shipping. All the electronic wizardry that makes this system so effective is completely invisible to the driver. There’s no need to change settings or switch the system on or off, so it doesn’t distract from the driving task. The one exception is switching on the APU function. The driver display, which Hyliion calls OPE for On-dash Portal Experience, has a selector for the desired APU run time of one, four, or 10 hours. If 10 hours is selected, the system will preference energy storage rather than driving assist in order to build the charge for the pending 10-hour run time. Moreci said the system charges remarkably fast and will completely recharge for another 10-hour run on less than an hour of driving time. The best way to describe the feel of the system when it’s in assist mode is the truck simply feels lighter. You don’t feel the typical load on the engine because the electric drive axle is helping with the thrust effort. This is more noticeable at low speeds, such as while maneuvering around town. 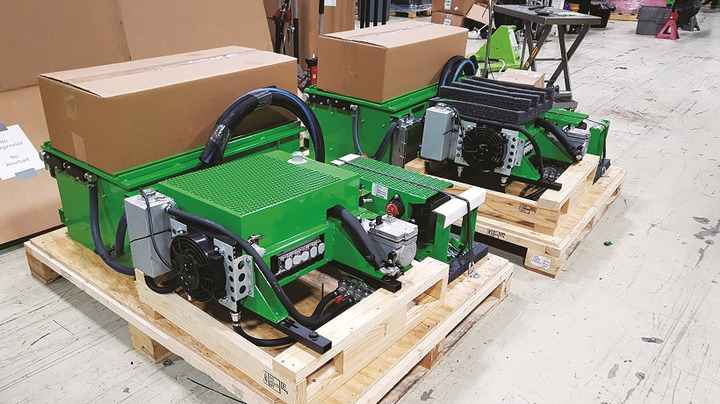 The system switches to charge mode while braking, using the momentum of the truck to turn the generator/motor. The increased load on the system from charging feels something close to the first position on an engine brake. On the highway, it’s not noticeable at all, except for the Charge/Assist alert and the fuel mileage display on the OPE. Anytime the engine brake is engaged, the system will charge, and while coasting I could initiate some charging by just resting my foot on the brake pedal. We tested the system on an elevated expressway in Austin, which is otherwise pretty flat. The trailer was loaded to 45,000 pounds and the GVW was 77,000. At times with the assist it felt more like 47,000 pounds. According to OPE, at times when the assist function was active we were getting anywhere from 11 and 12 mpg up to 15 mpg. The in-cab display, called OPE for On-dash Portal Experience, displays charge or assist mode, as well as the battery’s state of charge and the current fuel consumption. The system is not designed to provide a quicker launch or faster uphill climbs. It just adds thrust to the rear axle, the electric axle, to take some of the load off the engine, and thus cut fuel consumption. Hyliion’s hybrid electric propulsion system is the only one of its kind on the market right now. Despite all the activity on the battery-electric vehicle front, Healy believes a BEV for the long-haul segment is still at least a decade away. With a few hours driving experience under my belt, I have seen this technology work and I think it is an immediate solution. Nikola plans to make hydrogen the transportation fuel of the future. Plenty of hurdles remain to be overcome before that happens, but the strategy the company disclosed at Nikola World 2019 seems workable. One of the biggest challenges could be getting the rest of the world to see the solution as Nikola sees it.